Back in January I was participating in the "Just Another Blogging Challenge" and I was talking about a floral dress that I had managed to grab from +Very.co.uk for the bargain price of £17.00. 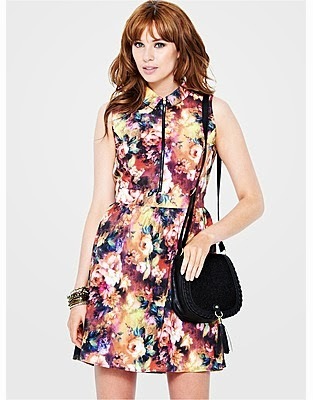 Sadly this dress is no longer available so this post is a little like "here's what you could have won". Sorry about that! This is the dress that I chose to wear for my birthday last Saturday and I can honestly say that I have not felt as good in something for ages. I absolutely adored it. I am wearing with purple tights from +Yours Clothing and shoes from +schuh. I'm not sure where the black shrug is from as I have had it forever. Thank Louise, I really felt it that day! I love this dress so much !